The heat of vaporization, ( or ) is the amount of thermal energy required to convert a quantity of liquid into a vapor. It can be thought of as the energy required to break the intermolecular bonds within the liquid. It is also often referred to as the latent heat of vaporization ( or ) and the enthalpy of vaporization ( or or ) and is usually measured and reported at the temperature corresponding to the normal boiling point of the liquid. Sometimes reported values have been corrected to a temperature of 298 K.
Heat of vaporization values are usually reported in measurement units such as J/mol or kJ/mol and referred to as the molar heat of vaporization, although J/g or kJ/kg are also often used. Older units such as kcal/mol, cal/g, Btu/lb and others are still used sometimes. Figure 1: Heats of vaporization versus temperature. The heat of vaporization is not a constant. 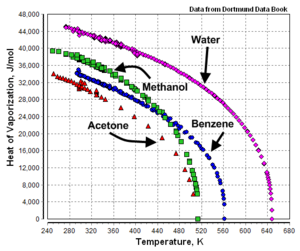 It is temperature dependent as shown in Figure 1 by the example graphs of temperature versus heat of vaporization for acetone, benzene, methanol and water. As shown by the example graphs, the heat of vaporization of a liquid at a given temperature (other than the normal boiling point temperature) may vary significantly from the value reported at the normal boiling point of the liquid. Heats of vaporization can be measured calorimetrically and measured values are available from a number of sources. However, data is not always available for certain liquids or at certain temperatures. In such cases, estimation of heats of vaporization can be made by any of a large number of different methods. Four of the commonly used methods are discussed in the following sections. As an example of using the Clausius-Clapeyron equation, given that the vapor pressure of benzene is 1 atm at 353 K and 2 atm at 377 K, benzene's heat of vaporization is obtained as 32,390 J/mol within that temperature range. Tc = 647.3 K and Pc = 221.2 bar (218.3 atm), the heat of vaporization is obtained as 42,060 J/mol. That is within 3 percent of the 40,660 J/mol in Table 1. Table 2 provides some examples of the application of Trouton's rule. Trouton's rule fails for liquids with boiling points below 150 K. It also fails for water, alcohols, amines and liquid ammonia. Watson's equation has achieved wide acceptance and is simple and reliable. ↑ Carl L. Yaws (1998). Chemical properties Handbook, 1st Edition. McGraw-Hill. ISBN 0-07--073401-1. ↑ Václav Svoboda and Henry V. Kehiaian (1985). Enthalpies of Vaporization of Organic Compounds: A Critical Review and Data Compilation, IUPAC Chemical Data Series 32. Blackwell Scientific. ISBN 0-632-01529-2. ↑ Perry, R.H. and Green, D.W. (Editors) (2007). Perry's Chemical Engineers' Handbook, Eighth Edition. McGraw-Hill. ISBN 0-07-142294-3. ↑ 7.0 7.1 7.2 J.M. Smith, H.C. Van Ness and M.M. Abbot (2004). Introduction to Chemical Engineering Thermodynamics, 7th Edition. McGraw-Hill. ISBN 0-07-310445-0. ↑ Robert C. Weast (Editor) (1976). Handbook of Chemistry and Physics=56th Edition. CRC Press. ISBN 0-87819-455-X. ↑ M.M. Abbott and H.C. Van Ness (1989). Schaum's Outline of Thermodynamics With Chemical Applications, 2nd Edition. McGraw-Hill. ISBN 0-07-000042-5. ↑ 14.0 14.1 Bimalendu Narayan Roy (2002). Fundamentals of Classical and Statistical Thermodynamics. John Wiley & Sons. ISBN 0-470-84316-0. This page was last modified 17:25, 30 April 2012.